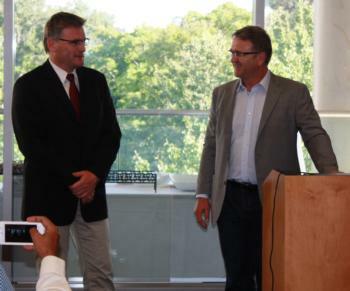 The recipient of the European Seed Association (ESA) “Outstanding Student Award” for the third class of the UC Davis European Plant Breeding Academy is Dr. Volker Marwede, Norddeutsche Pflanzenzucht Hans-Georg Lembke KG, Germany. Over the course of the program, Dr. Marwede showed superior performance in terms of assignments and the final project. In addition, Dr. Marwede had outstanding support from his peers for his in-class contribution to the learning process. The award presentation will take place during the General Assembly at the upcoming ESA Annual Meeting in Vienna on October 11-13, 2015. ESA, the European Seed Association,is the single EU-wide organization representing the associations and companies active in research, breeding, production and marketing of seed of agricultural, horticultural and ornamental plant species. The award is sponsored by SeedWorld, the voice of the global seed industry. The European Plant Breeding Academy is organized by the University of California, Davis, in cooperation with several European institutions and organizations. It is a postgraduate program that teaches the fundamentals of plant breeding, genetics and statistics through lectures, discussion and field trips to public and private breeding programs. Employers appreciate the opportunity to provide their valued employees advanced training without disrupting their full-time employment. Participants attend six 6-day sessions in six countries. The instructors are internationally recognized experts in plant breeding and seed technology. Applications are now being accepted for the third class of the European Plant Breeding Academy beginning in October of 2015. For more information on the UC Davis European Plant Breeding Academy or the Plant Breeding Academy in the United States visit http://pba.ucdavis.edu or contact Joy Patterson, jpatterson@ucdavis.edu.